Developed by one of the oldest software providers in the industry, Aristocrat, Choy Sun Doa is a great example of how an exciting and thrilling online slot machine should look and function. The developers from Aristocrat like to keep games as simple as possible while putting great value on the features and payout ratio instead. Keep reading this complete review to find out all there is to know about Choy Sun Doa. From a game that has a title that translates to ‘ God of Wealth’ you can not expect of anything else but very generous rewards. With that in mind, the developers from Aristocrat designed this online slot with 5 reels and 243 ways to win. This is the highest-paying combination because Choy Sun Doa is one of the few games that allows you to select the number of reels as well. So, you can play starting with 1 reel and up to a total number of 5. Besides these excellent features, Choy Sun Doa has a wild symbol that can substitute any other on the reels and boos your win. The only symbol it can not substitute is the Scatter, which awards you with a different number of free spins. You can enjoy between 5 and 20 free spins, each with different characteristics, depending on how many scatter symbol you manage to land. The God of Wealth is very generous and will repay you for the courage of enjoying this free slot, however, in order to prove yourself worthy, you will first need to learn all there is to know about Choy Sun Doa. The best way to do that is by enjoying it for free on Pokiestar and make sure you understand all of its features, try different set-ups such as different bet sizes or different reel numbers and make a strategy that will help you win when you play with real money. Once you feel you are ready to try your luck with real funds, make sure you find an online casino that offers you a generous welcome bonus and that has a great reputation in general. If you’re not sure how to find such a casino, Pokiestar helps you with some tips in that direction as well. Jackpot Joy, for example, offers you a 100% bonus up to $200. Gday Casino and River Belle Casino also offer an awesome 100% that goes up to $100. 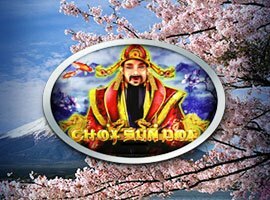 All things considered, Choy Sun Doa online slot is another great product released by Aristocrat that offers everything a casino player might want to find. Selectable reels and bet sizes, bonus rounds and free spins features to boos your winnings.